A glorious example of design and urban green space. To address a popular question over the last couple of days, a pocket park or mini-park is a small park/green space open to the public. In some areas they are called parkettes or vest-pocket parks, which I hadn’t heard until reading the wikipedia article. Due to their smaller size, they avoid large scale redevelopment and usually don’t include active recreation options. 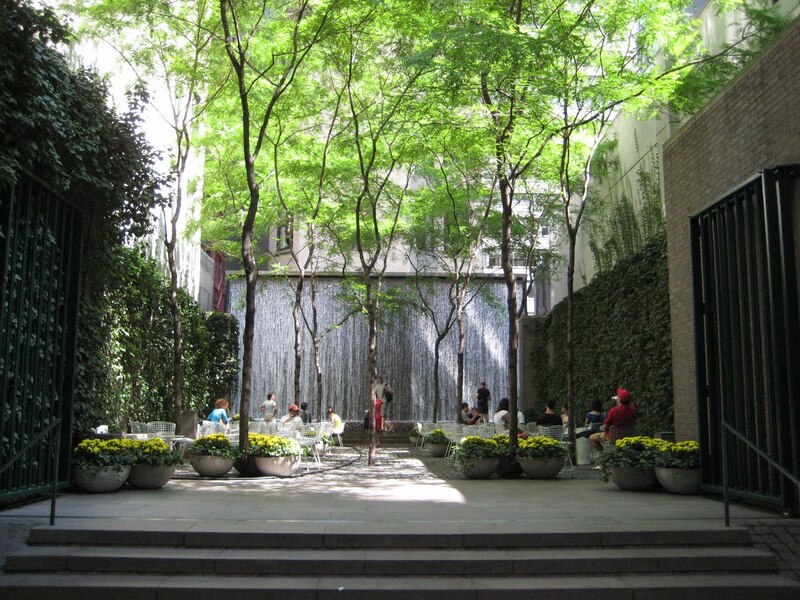 In the case of an all-time favorite pocket park, Paley Park in NYC, pocket parks can be sandwiched between development on multiple sides, enclosing the area and aidng in the respite experience for the users. The combination of the honeylocust, the green covered side walls, and the waterwall in the back are brilliant. Huge impact with a minimal amount of materials. Beautifully simple. So tomorrow, bright and early, Keep South Bend Beautiful will generate our own pocket park. Inspired by Rebar’s Park(ing) Day original parking space take-over in 2005, KSBB hopes to generate buzz for the green spaces we do have in South Bend. The rebel, guerilla landscape architecture approach is so satisfying; especially when getting folks to discuss their green spaces and landscape architecture. Hope to see you all sometime between 8:00am and 3:00pm outside Fiddler’s Hearth for a beautifully simple way to raise awareness. This entry was posted in Uncategorized and tagged City of South Bend, Fiddler's Hearth, Foegley Landcape, keep south bend beautiful, Paley Park, pocket parks, Project for Public Spaces, Red Hen Turf Farm. Bookmark the permalink.